Sculptures, Awards and Teddies, oh my! It's been a really busy time for the Readers in Residence as their residencies are drawing near the end and they are wrapping up all of their marvellous projects with libraries all over Scotland. East Renfrewshire Libraries, who are hosting Reader in Residence Drew Campbell, will be kicking off their Summer Reading Challenge for adults this weekend. If you are in East Renfrewshire you can drop into your local library to find out more about how to take part. We've also heard that East Renfrewshire have recently launched a really clever libraries app which allows you to order a book from East Renfrewshire Libraries using your mobile phone. If you are out and about and spot a book you fancy reading, scan the barcode and the app will order it for you to your nearest branch. It's available to download from Google Play Store or iTunes. Over in Leith, Emily Dodd has had a ridiculously busy time, hosting a wildly popular Teddy Bears Sleepover in the library (WARNING: this link contains incredibly cute pictures of teddy bears 'galavanting'). Their exploits were also tweeted live on twitter overnight and there is a photo album on Facebook too. 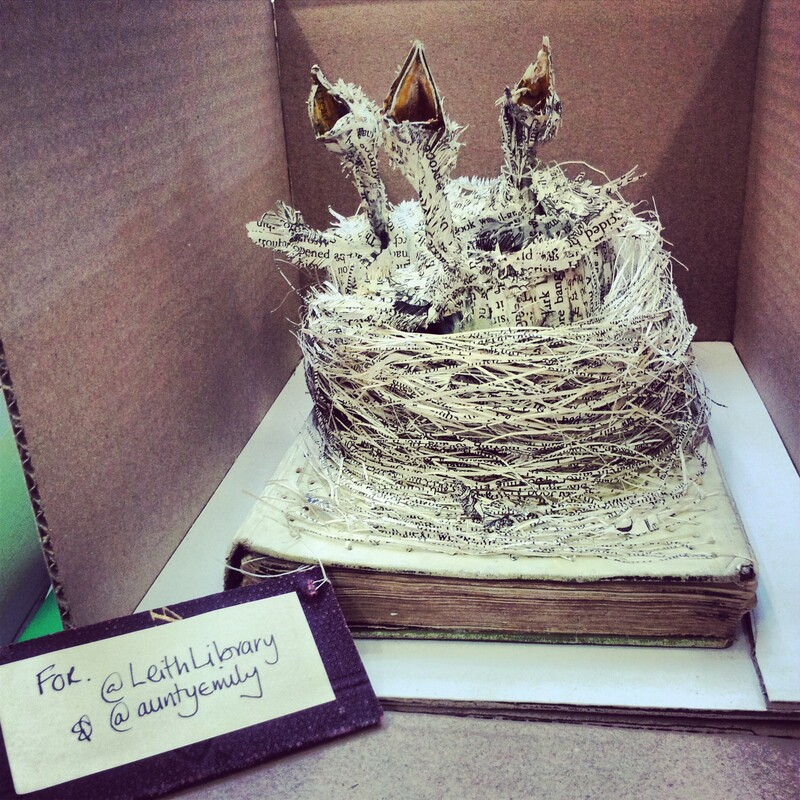 Last week, there was a very special delivery to Leith library, a beautiful hand-made book sculpture dedicated to Leith Library and Emily, celebrating her brilliant work championing libraries and reading. Thanks to the mystery book sculptor - whoever you are! Deborah Leslie, our Aberdeenshire Reader in Residence, had a great time hosting the Grampian Children's Book Award last month, which was won by A Monster Calls by Patrick Ness. The winners were voted for by pupils, which just shows that young readers in Aberdeenshire have excellent taste! Glasgow Women's Library have been running their usual brilliant Read, Relax, Recharge group, walking tours and their Illuminated Letters Exhibition and Reader in Residence Magi has been getting involved with just about everything that's going on. There is an excellent series of events organised by Glasgow Women's Library in Edinburgh Central Library this month, including the Extraordinary Ordinary Women exhibition which is very much worth checking out. And finally, Alison Miller, our Orkney Reader in Residence, has been inspired to write a poem by her septic tank, and is welcoming the brilliant author Amy Sackville (whose novel Orkney has been making waves) this evening at Orkney Library. She also kindly took time out of her busy schedule to write up an excellent list of books set on Orkney for SBT--check it out here! This year of residencies has been so brilliant an eventful, and our Readers and Libraries have been absolutely amazing, exceeding everyone's expectations! The Reader Development Team here at Scottish Book Trust couldn't be happier and would like to say thanks a million for your exceptional efforts!